Kathy Wise demonstrates how she uses Special T thick CA glue and NCF Quick accelerator in various techniques while shaping and assembling her intarsia projects. While this video focuses on intarsia, many of the techniques presented are useful for other types of woodworking as well. Forming color breaks- A color break is when two or more different colors of wood meet and are glued together as one piece. Bonding risers to project pieces- Risers are used to make a piece higher than surrounding pieces without using thicker wood. Intarsia is created by selecting different types of wood, using its natural grain patterns and colors to create the different colors in the pattern. Each piece of wood is then individually cut , shaped, and sanded before fitting them together like a jig-saw puzzle and gluing them to a piece of 1/4 inch plywood backing cut to the shape of the final product. Sometimes, additional pieces of plywood are used to raise areas of the pattern to create more depth. Once together, a final layer of finish is applied and the project is complete. Kathy first began designing intarsia patterns for her father-in-law (Phil MacDonald) over 13 years ago. She offers the greatest variety of dog breed intarsia patterns found anywhere. She has developed a beginner intarsia kit that is very unique and easy to use. In Fall of 2004, Scroll Saw Workshop (Fox Chapel Publishing) published the first article by Kathy featuring her Boston Terrier intarsia design and step by step instructions. She has been in every issue since then with over 25 articles to date. Kathy has two wonderful intarsia books- "Intarsia Woodworking Projects" and "Intarsia Woodworking for Beginners". They are perfect for the woodworker just learning intarsia or for seasoned experts. She is currently working on her third book. Kathy accepts special commissions for her intarsia work, including murals and large wall pieces. 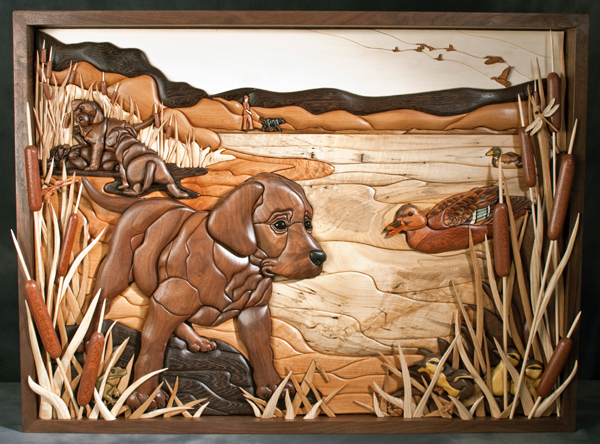 The intarsia pictures on this page and on the "How to use our CA Glues" page are works from her website. Visit www.KathyWise.com for more information.